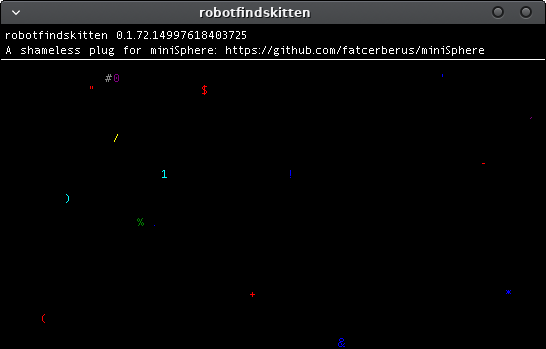 A long while ago, before miniSphere, and before the death and rebirth of the forums, I created a port of the game/zen simulation robotfindskitten, but my laptop died, destroying all of my old stuff. Since my original version wasn't very good anyway, I decided to recreate it, using miniSphere's API. In this game you are robot (#). Your job is to find kitten. This task is complicated by the existence of various things which are not kitten. Robot must touch items to determine if they are kitten or not. The game ends when robotfindskitten. Haha! I vote this Sphere GOTY 2017. A game that took 4-5 hours to make wins the prestigious status of GOTY? Woo! "A stegosaurus, escaped from the stegosaurusfindrobot game. It finds you." That must be the prequel.